Wild garlic Allium vineale L. vs. Wild onion Allium canadense L. Liliaceae (Lily family) Life cycle Perennial. Leaves of wild garlic are hollow and branch off the main stem. Leaves of wild onion are flat, not hollow, and emerge from the base of the plant. Leaves of both plants are thin, green and waxy, and can be confused with grasses when young. Stems Wild garlic stems occur singly, are hollow and branched into leaves. Wild onion stems occur in bunches, are not hollow and not branched. Both emit a garlic odor when crushed or cut. Wild garlic flowers may be green or purple; wild onion flowers are generally white or pink and are found on top of solid flowering stems. In both species, flowers are often replaced by aerial bulbs. Reproduction Aerial and underground bulblets primarily, occasionally seed. Wild garlic bulbs have a thin membranous covering. 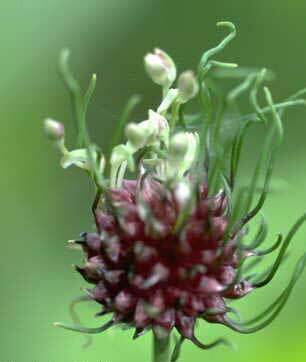 Wild onion bulbs have a net-veined covering.